THE MINISTER for Defence has dismissed suggestions of a link between the suicides of members of the Defence Forces and a drug prescribed to them to prevent malaria. 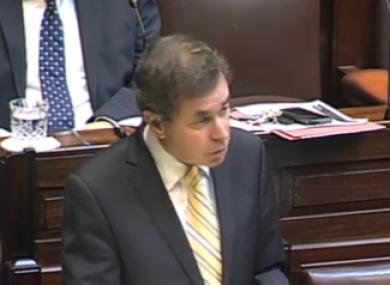 Alan Shatter said an investigation into an alleged link between Lariam and mental health difficulty had concluded it was “extremely unlikely” that the drug had played a part in the deaths by suicide of several soldiers. The drug is one of three licensed by the Irish Medicines Board for the treatment of malaria – but it has long been alleged that use of the drug coincides with a higher risk of suicide, or suicidal ideation, among those who are prescribed it. In an RTÉ documentary last month, two experts called for an urgent inquiry into the prescription of Lariam for Defence Forces personnel – identifying a higher suicide rate among those who had taken Lariam than those who had not. “To assert that one [of the three licensed drugs] is any more safe or effective than another is “a grossly misleading over-simplification,” Shatter told the Dáil this afternoon. Shatter said all three of the drugs – Lariam, malarone and doxycycline - approved by the IMB had been prescribed by the Defence Forces depending on the circumstances, such as the particular region of Africa that personnel were being deployed to, and the duration of their tour. Of the 156 non-service-related deaths of Defence Forces personnel between 2000 and 2010, Shatter said, 25 were from self-inflicted injuries. Nine of those personnel had been prescribed Lariam before touring sub-Saharan Africa. However, “given the limited period of time in which Lariam remains in the bloodstream, according to our expert advice, it is extremely unlikely that Lariam could have been a contributory factor in all of these cases,” the minister said. The death rate among Defence Forces personnel from self-inflicted injuries during that period was 0.24 per cent, he added – while in the previous 11-year period, where the drug was not prescribed, the equivalent rate was 0.32 per cent. “The Defence Forces are fully aware of range of the reported side-effects attaching to all anti-malarial medications,” he said. Pressed by Sinn Féin’s Padraig Mac Lochlainn as to why other countries had stopped using the drug, apparently having been alerted to the same concerns, Shatter said the United States had stopped administering it “due to concerns about inadvertent prescribing of the drug of soldiers who should not take it”. “The US authorities undertook mass administration to Larium for soldiers serving in areas subject to malaria, without any individual screening of personnel,” he said. By comparison, select Irish personnel were prescribed the drug for brief periods before travelling, so that any negative reaction could be identified before they departed for duty. Email “Shatter dismisses link between anti-malaria drug and soldiers' suicides”. Feedback on “Shatter dismisses link between anti-malaria drug and soldiers' suicides”.